Whether you consider yourself involved in the scrap industry or not, the reality is that if you are a significant steel consumer then your costs are in part driven by what is happening in the steel scrap market. Not only are your costs influenced by scrap supply and demand within the continental US, but they are also influenced by what is happening to steel scrap demand in far-off Turkey. That seems hard to believe for a consumer of bars, plates or sheets in, say, Tulsa, Oklahoma, but the Turkish steel industry has, in a short ten-year period, risen to become the largest seaborne scrap market in the world and in the process sucked in scrap not just from neighboring Europe, but from the Eastern seaboard and Gulf ports of the US. In a presentation last week at The Steel Index Scrap Conference in Amsterdam, Ugur Dalbeler, CEO of CÃŒÂ§olakoglu Metalurji A.S., one of Turkey’s many steel makers, gave an interesting presentation on the growth of the steel industry and its impact on scrap demand around the Atlantic basin. Turkey has been undergoing phenomenal — to many, surprisingly robust — growth for much of the last decade. In spite of a dip post-9/11, Turkey has maintained a healthy growth rate to rival many emerging markets. In 2010 it delivered 8.9 percent GDP growth, easily the best in Europe and was third among the G-20, behind only China and Argentina, but ahead of India and Brazil. Driven largely by a construction boom both domestically and in neighboring MENA (Middle East and North Africa) markets, Turkey’s steel industry has grown 95 percent since 2001 and 2010, outperforming all other markets except China at 313 percent and India at 145 percent. Nor has Turkey followed the Asian model of building largely integrated steels mills around the BOF blast furnace process. Constrained by capital, most growth has come from EAF mills in the Nucor mold, with most blast furnaces a decade (or more) old. But demand for flat rolled products is rising; as local downstream manufacturing becomes more sophisticated and developed, there are now five steel plants producing HR coil compared to only one in 2009. Three new ones are planned by 2015 and three new blast furnaces are due to start up next year. Although Turkey has followed the Nucor business approach, mills there lack the technology to produce high-quality flat-rolled products from the EAF production route. 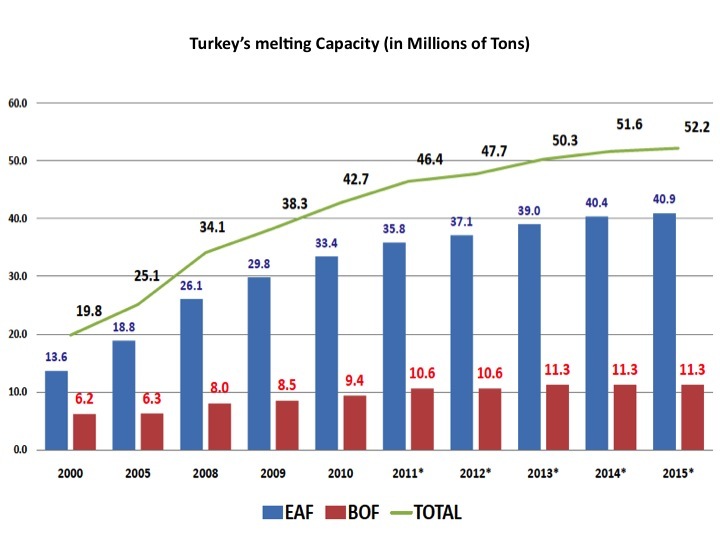 Although BOF mills do consume scrap in the blast furnace charge, it is the rise of EAF production that has driven Turkey’s scrap consumption. 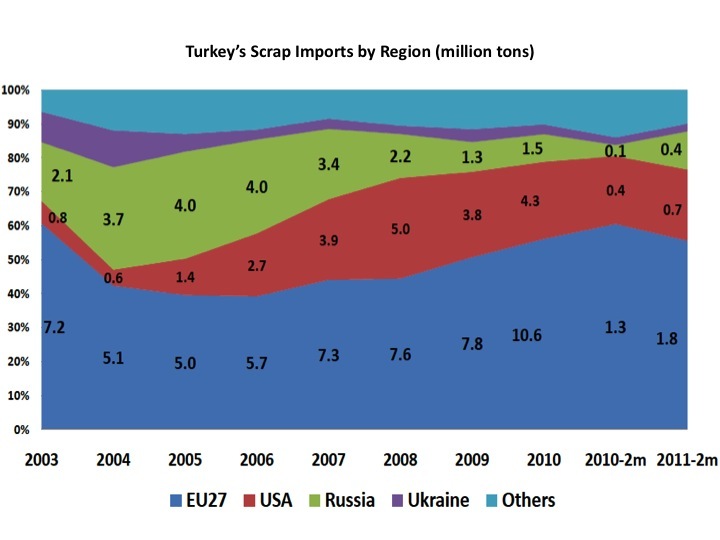 Last year, Turkey imported over 20 million tons out of a total 25.3 million tons of steel scrap consumed, or 19 percent of global scrap imports and still rising. 2011 imports are expected to top 22 million tons. As this graph shows, Turkey’s imports by region have changed, as total imports have risen during the second half of the decade. The US has become progressively more important as a source of supply at the expense of Russia. In part, this may be due to depreciation of the US dollar; also, to rising domestic demand in Russia and to restrictions imposed by the Russian authorities to preserve scrap supplies for domestic producers. But the impact for the US market has undoubtedly been to reduce scrap availability domestically and raise prices as processors have both domestic and export markets vying for supplies. With Japan out of the market this year, following the tsunami and aftereffects of the reactor problems, US West Coast suppliers are also going to see rising Asian demand pulling scrap westwards while Turkey pulls it east. 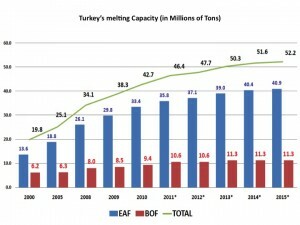 Turkey’s steel production is projected to rise further, right through to the middle of the decade, with EAF melting capacity along expected to increase from about 35.8 million tons annually this year to 40.9 million tons by 2015, adding a further 5-6 million tons of demand to the seaborne scrap trade. This will continue to place a floor under scrap prices in the US and Europe, particularly if domestic consumption rises as expected in those markets as the recovery continues.